Aloha! The fresh, floral air energizes you. The warm, tranquil waters refresh you. The breathtaking, natural beauty renews you. As the sun sets, you look around, you're on an exotic island, wearing a straw skirt and flowers in your hair. This can be your life if you upgrade now to Hawaii Coco! 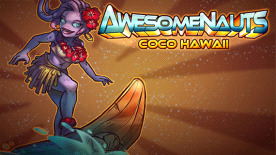 This DLC contains a custom skin for Coco in Awesomenauts, and will automatically unlock the character if you have not already done so.